Kansas City Missouri – Page 2 – Welcome to Wyandotte Daily! A Harvesters and GEHA food distribution scheduled tonight for persons affected by the federal government shutdown has been canceled because of the extreme cold weather, according to an announcement. The distribution that was canceled was scheduled from 4:30 to 6:30 p.m. Wednesday, Jan. 30, at the Pipefitters Local Union 533, 8600 Hillcrest Road, Kansas City, Missouri. • Thursday, January 31 – IBEW Local Union 304, 3906 NW 16th St.., Topeka, KS 66618, from 4:30 – 6:30 p.m. There are no requirements to receive help at these sites. Walking into the Hy-Vee Arena (the former Kemper Arena) recently brought back memories for Kansas City, Kansas, product Ed Corporal. Corporal, the head coach of the Kansas City Tornadoes professional basketball team, is preparing for the season home opening weekend on Friday, Jan. 11 and Saturday, Jan. 12, against the Raleigh Firebirds. The games will begin at 7 p.m. at Hy-Vee Arena, Kansas City, Missouri. The Tornadoes are in The Basketball League, formerly the North America Premier Basketball League. Corporal, who has been a coach for 31 years, describes the Tornadoes as a “very, very up-tempo team.” At the same time, it will be a smart, tough team that plays very aggressive defense, he added. “Our team is equivalent to an NBA team in height and limb,” he said. It’s more of a development team, where players go to get ready for the NBA G league and the NBA, he added. They work on their skills at this level. Last year, the team went 15-15 and was one game away from the finals. “If you come to watch, you’ll see a very exciting team,” he said, adding it may be similar to watching the Kansas City Kings. Previously Corporal was the Tornadoes’ assistant coach. Otis Birdsong, a former player for the Kansas City Kings, is the president of the Tornadoes, is one of Corporal’s inspirations, and is like his brother, he said. Corporal recalled his days as a ballboy for the Kansas City Kings in the 1980s. Corporal said he’s very humbled by the experience. Just being a coach in his hometown is very special to him, he added. It has been a long way since his younger days at Stony Point South School. Since those days as a ballboy, Corporal has played basketball at Schlagle High School, Kansas City Kansas Community College and Pittsburg State University. He has a bachelor’s degree in management from MidAmerica Nazarene University. Besides being inspired by Birdsong, Corporal said he was inspired and mentored by Cotton Fitzsimmons and Walt Shublom. While he did not play for Wyandotte High School, Corporal formerly attended Shublom’s basketball camp at KCKCC, and he was in seventh grade at Arrowhead Middle School when he first met Shublom. “By the time I went to high school, he took me under his wing,” Corporal said. Corporal became a counselor in one of Shublom’s sports camps in Liberty, Missouri. Another big influence on Corporal’s coaching career was Randy Springs, who coaches at Sumner Academy, Wyandotte and Topeka. Corporal worked under him for 10 years at Sumner Academy. Corporal is a past coach for three Kansas high school championship teams at Schlagle and Sumner Academy. 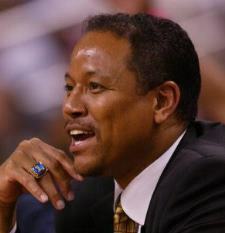 Corporal also previously served as head coach of the Arkansas RiverCatz in the American Basketball Association and was associate head coach for the Arkansas RimRockers. He also has coached at Pittsburg State and at Park University. Few people have faced the challenges that Corporal has faced and come through them. Five years ago, Corporal had two massive strokes within 24 hours, leaving him paralyzed and unable to walk. He was coaching volleyball at Perry-Lecompton school at the time and it happened in the middle of the season, he recalled. He spent about a year-and-a-half undergoing physical therapy, learning how to walk again. When he went home after six months, he had to continue rehabilitation. He had to walk with a cane and walker for a while, then gradually he got better, and returned to coaching, he said. During his recovery period, he helped out around the University of Kansas men’s basketball program with mentoring and other tasks. He was asked to come back to Sumner Academy to help with the team. Corporal has a place in his heart for young athletes in Kansas City, Kansas. He has met with administrators in the Kansas City, Kansas, Public Schools and offered his assistance in helping to be a mentor for young athletes and also for coaches. The team plans to go to high schools and middle schools in the district and hold practices there, he said. “Our guys go and speak to young men and women about life skills and things going on in their lives, academics, peer pressure, making life decisions,” he said. Also, each school will receive tickets to attend a Tornadoes game. If he is asked by youth for advice, he emphasizes education. For more information on the Kansas City Tornadoes, visit http://www.kctornadoes.com/.